The Bullmastiff is a stout and powerful breed commonly adopted for family protection. The breed draws a solid size and strength foundation from its English Mastiff roots. 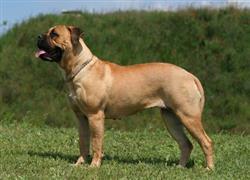 Many owners opt for a name that equally portrays the build of the Bullmastiff. For this reason, names like Tank, King, Bowser, and Dozer are common choices. On the flip side, the breed gains much of its protective nature from the Bulldog. In fact the Bullmastiff was originally bred as a guard dog to ward off poachers. Since a large number of owners seek these dogs for security and protection, names like Boss, Justice, and Buster have become increasingly popular. Some of our pages will contain a subcategory. A subcategory is a slightly more specific grouping than the main topic of the page. For a subcategory, we will include a separated table of names and corresponding descriptions. An example of a subcategory of Red Dog Names would be 'Dog Names Inspired by Red Wines'. If you have any subcategory ideas for the Bullmastiff Names page, we would love to hear them. Use the form below to submit your ideas.